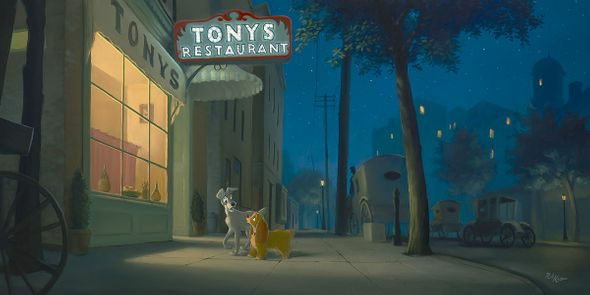 Rob Kaz Signed and Numbered Hand-Embellished Giclée on Canvas: "A Night With Lady-Lady and the Tramp"
Today, Rob's work is a mirror of his background in animation. ""I am one of the biggest fans of animation art you'll meet and being able to paint Disney is really an honor,"" he says. ""I have had the privilege of working with many Disney artists and they inspired me to make the transition from animation to fine art. I want artists and fans alike to enjoy how I try to expand on the movies and add something more from my perspective."""